fantastic piece love what you did with the focal, your work is always so beautifully neat! Awesome! 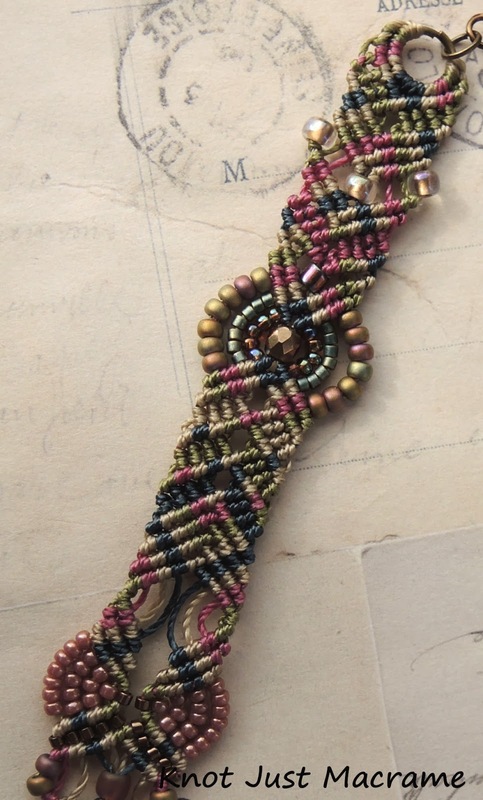 I never tire of seeing the unbelievably beautiful designs you create with just some string and a few beads, Sherri! Hahahaha - and I've been waiting on pins and needles to see what YOU made! Gorgeous Sherri, I have been a fan of yours for years now and you never cease to amaze me with your creations. What a nice thing to say - thank you! Lovely color palette. Such a conversation piece. As always, your work is stunning. I love how the macrame flows into the skull. The "gussied up" middle portion and bail is amazing. Mind...blown... Totally in love with what you created. Thank you for participating! Thanks, Diana P. I loved this hop - there are some GREAT pieces! That is an absolutely amazing necklace! I am in awe! WOWZERS!!!! Jaw dropping beautiful! Stunning works of art! Thanks for sharing! Happy Halloween! I already follow you on Facebook and am just blown away by your work. I LOVE this piece, gorgeous colors, love the focal! That is one of the coolest pieces in this hop. Thanks! I adore your Poe necklace!!! WOW, your work is amazing. I can not find the words to decribe how stunning I think you work is. How many hours went into this design? I thought wire wrapping tiny glass flowers was time consuming, I can't even imagine how much work went into the design and creation of this amazing necklace. You are my new hero! Cheers! Your necklace is sooooo beautiful! Wire wrapping all those tiny glass flowers was worth it! What a great necklace! Hopefully you have found a party to take your skull too. Wow. Just wow. I'm so impressed with what you've created! And thanks for introducing me to Star Spirit Studio too! Very cool necklace. It makes me want to learn macrame. Hahahaha - who said I had my sanity? 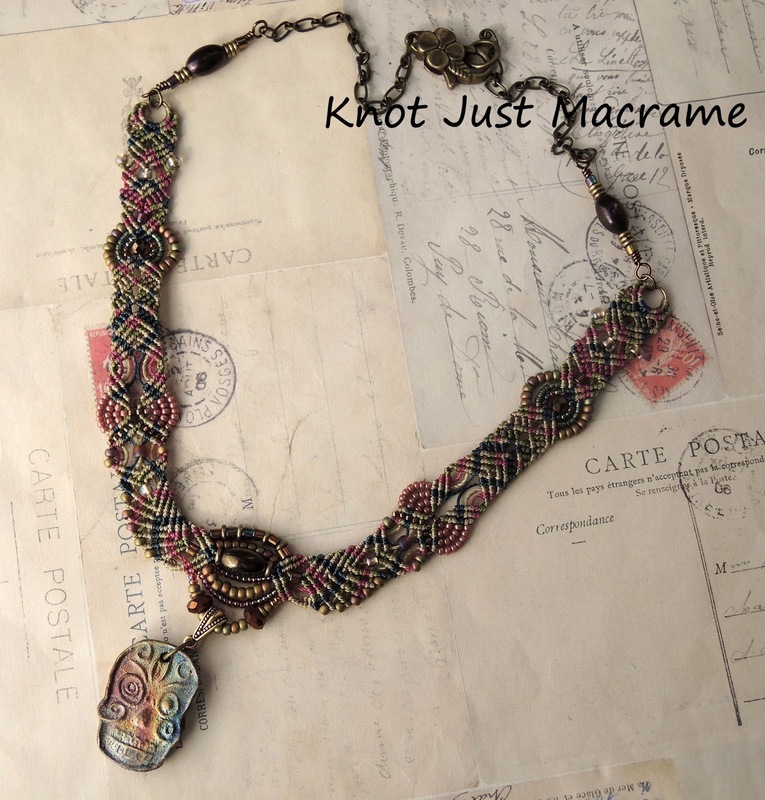 Hi Sheri., I love the work you do with Macrame and this necklace is absolutely fantastic ! Beautiful sugar skull and great matching of beads! Happy Halloween/Day of The Dead! Wow - another stunner! Love how you made the front beadwork look sort of like an 'eye' and how that gorgeous skull hangs just below it - very cool!! The colors are super, too. Amazing! Raku does have a diverse palette and you created such a lovely color scheme! My gosh I adore your blog! Even though this has less of that AMAZING colour that your work has, it's still so beautiful! I don't have a single local shop to buy from, so shop online. I troll Etsy for most of my "special" pieces - the focal pieces and the artist beads. I use ArtBeads.com and AuntiesBeads.com and BelloModo.com quite a bit. What an incredible choice of colors - I love what you did with this - so original! Gorgeous! Your color choices are perfect for the pendant and the micro macramé really looks fantastic with it! Wow-- you really took inspiration from the focal and ran with it! Fabulous work!! Happy Hallowe'en!! Your work is just absolutely stunning. I am so in love with every thing that I have seen on your blog. I love the Day of the Dead skull. I can't look enough at your work. Love it, absolutely amazing!